Olympic gold medallist James DeGale was ringside at the ExCeL Arena in London on Saturday night, getting a taste for the professional game after deciding to quit the amateur ranks. What he saw should have both thrilled and chilled him. The adulation heaped on Amir Khan before, during and especially after his two-round destruction of Oisin Fagan will no doubt have provided him with added confidence and inspiration, though it appears the ultra-confident Londoner needs no help in that department. 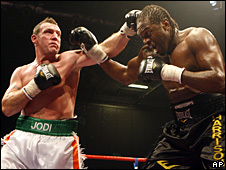 Contrast Khan's win with the continuing sad demise of Audley Harrison, whose career looks all-but over following his points defeat at the hands of Belfast taxi driver Martin Rogan. Harrison's tale serves as a salutary warning that Olympic gold is not a guarantee of untold riches in the pro game. Where does the former Sydney super-heavyweight king go now? Even the seasoned Frank Warren, who normally has a snappy answer for any tricky questions fired his way, was struggling with that one. "I don't know how he comes back, it's tough for him," said the promoter. Harrison has had numerous chances to resurrect a career that looked so bright eight years ago but has failed to take any of them. Given his track record, he will probably resurface in a couple of months or so and claim that a world title is very much within his reach. Some people may continue to agree with him. As Warren says, Harrison, now 37, possesses all the skills necessary to succeed, he just cannot execute when it matters most. Harrison should have beaten Rogan. He had his opponent in trouble with some wonderful combinations but backed off when everyone inside the arena, bar the vocal Irish contingent, was baying for him to deliver the coup de grace. No killer instinct? A lack of heart? Stage fright? Who knows what goes on in Harrison's head when he's in the ring. "He's got everything but he doesn't use it," lamented Warren. "There are times in a fight when he doesn't do anything." The same cannot be said of Khan. Making his ring return following his brutal, 51-second loss to Colombian Breidis Prescott two months ago, he appeared to have little self-doubt as he went about dismantling Fagan in less than five minutes. It was a clinical display and the perfect response after a potentially damaging defeat last time out. 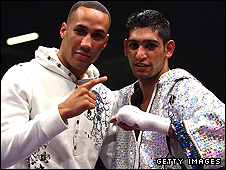 It also suggests Khan is once again destined for the very top of the game, if he gets his tactics right and continues to learn from renowned trainer Freddie Roach. Not that Khan is getting carried away following his 19th win in 20 pro contests. Boxing is all about bravado and hype, but the loss to Prescott has taught him to cut down on the bold predictions. "My time will come," said the Bolton boxer in the wake of his win over Fagan, a statement delivered simply and without cockiness. Warren towed the party line, talking of taking one fight at a time from now on, but Jesse Arevalo, who was in Khan's corner on Saturday night, broke ranks by stating his admiration for the 21-year-old. Standing in for Roach, who was in Las Vegas for Manny Pacquiao's superfight with Oscar de la Hoya, Arevalo said of Khan: "He's becoming a complete fighter. "He's young and a great finisher. I thought the fight would last longer than it did. I was surprised he finished it so quick." Asked how he rated Khan's display, he responded: "Very close to a 10. He did a good job, he kept his hands up and he was patient. He was able to see a lot more openings. "He's a talented kid. It shouldn't take him long to step up to world-class level again." Khan said before the fight against Fagan that he needed not only to win but to prove his chin wasn't made of glass. Some observers never thought it was about his ability to take a punch. That he rose to his feet, albeit shakily, following that first knockdown by Prescott demonstrated his durability to many. Most lightweights would have been knocked rigid by Prescott's punches. For the Khan believers, Saturday night was about him getting his tactics right and choosing the ideal moment to unleash his deadly combinations. He did that perfectly, disposing of Fagan with the minimum of fuss. He now plans to fight again in February, after heading back to the States for more quality time with Roach. "There will be no distractions," said Khan. "No-one cares about me over there." It appears not many care about Harrison either, in the UK or in the States. James DeGale take note.